Want to know something kind of funny - but oh so ridiculous? The first time I ever ate gluten free bread.... I cried. No, I'm serious... I really did cry. It tasted horrible, sat like a rock in my stomach and felt like claggy glue painted on a brick. Tasty, huh? I thought my sandwich eating days were over and I was never going to want to eat lunch again. But it turns out, I just bought a really terrible brand that didn't agree with my stomach and there were better alternatives. After a while of not having any bread, I decided I'd try to make my own bread as prior to going gluten free, I'd started to make my own sandwich thins (as I'd been envious of American blog friends who had them and they'd yet to arrive in Australia) and they were super easy. I picked up a packet of Orgran Alternative Grain Bread Mix - and hoped to goodness I could create the same thing. The first time I made them, I picked up on one huge difference - the dough was incredibly sticky. But then I remembered the easiest way to roll out my other sandwich thins was to have wet hands - so I wet my hands and the stickiness was no longer a problem. I pressed them out into flat disks, let them sit on the baking tray for about 20 minutes until they started to rise a little and then popped them in the oven. 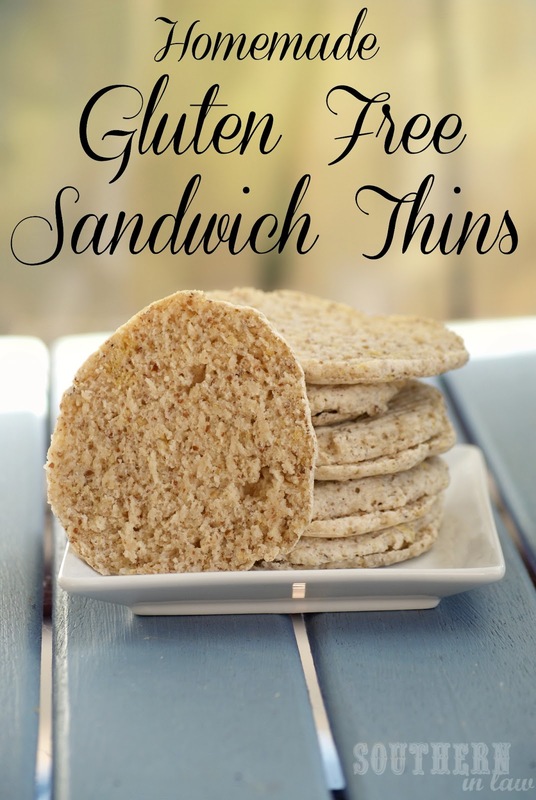 Well they looked the same as the gluten filled sandwich thins, albeit a slightly different colour - and the cooked the same - but would they taste the same? Of course not - I'm not a miracle maker... but they tasted good and that's all that mattered. Whenever I talk to my gluten free friends about bread they usually use terms like "sticky" "doughy" "heavy" "filling" - and these homemade gluten free sandwich things aren't any of those things. Because the bread is thin, it doesn't crumble and it means the focus is on the delicious fillings. You can eat the bread fresh (yes!) - or toast it for a bit of crunch - and it tastes really good! Best of all, it's super easy and inexpensive. Line 3 baking trays with baking paper. In a bowl, mix your bread mix and flax/sunflower seeds (if using). Gradually pour in your water, stirring to form a soft dough, until all of the flour has been mixed through. Get a cup of water and a spoon and wet your spoon before placing it into the dough. Wet your hands ready to form the dough. Scoop out about 2 tbsps of dough, and roll the dough with your hands into a bowl. Place the dough onto the baking sheet and flatten into a disc (the size of the disk will be the size of your sandwich thin) about 3"/7.5cm in diameter and about 1cm thick. 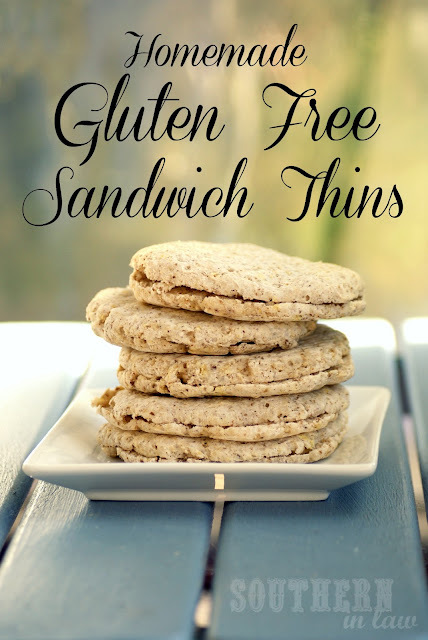 Repeat until all of the dough is used up and leave sandwich thins to rise slightly (about 20 minutes). Place into the oven for around 15 minutes or until cooked through. The bread will feel crusty on the outside and a knife will come out clean if inserted into the middle of the sandwich thin (I suggest doing it the way you're going to eventually cut them). Eat within three days or freeze for future sandwiches! If freezing, wrap them individually in cling wrap or freezer bags and place them into a zip lock bag, sealing tightly. *I add this in for an added flavour boost - as well as an added nutritional boost. You can add them or leave them out - it's completely up to you! **PLEASE PLEASE PLEASE be careful and don't cut your poor hands! And there you have it, the way to eat gluten free sandwiches - and trust me, it's easier than it sounds! If you can't buy Orgran bread mix, by all means try it with whatever you can buy! So tell me, what's your favourite sandwich filling? I'm currently obsessed with PB&J sandwiches after finally finding a jam I could eat with all of intolerances! these sound super amazing, and super lovely. This recipe looks great! I love experimenting with my own bread but have never used ground sunflower seeds! My favourite sandwich filling is cream cheese. I am currently on a smoked salmon cream cheese kick! It actually gives it a really nice flavour - as well as a nutritional boost! I love cream cheese too - it goes with so many different things! They are so good because the bread isn't too much of the focus (which is the worst when it comes to GF bread) and so easy!